My friend Damian has gone, unfortunately, tattoo mad, and is in the process of obtaining 8 tatts. He's been bugging me to design one based on his star sign, Taurus. I keep going "Celtic" - he keeps going " nice, but not what I want". Here's one for general consumption, if ya like it. The work was done using a Tablet, str8 into Photoshop, on a sleepless night. may i use it as a tattoo?? Wow do I love this. sure. he wasn't game enough to do it himself. that is one cool damn tattoo! I can't think why he wouldn't want it! Did you sell the design yet? I'm sure some place would love it. to tell you the truth ... i've never thought of selling it to a place. art such as this (i think people call it Gift Art) is how i look at my work in general. i have issues with putting a price tag on it. I see how you would have reservations....I have a lot too when it comes my stuff as well. I often give embossings as presents at Christmas to a couple people. Someone suggested that I try to sell my stuff as well....printings I think I could do....but illustrations are harder to part with. But I just thought I'd suggest it....*shrug*....gotta pay the bills sometimes....too bad there isn't a worldwide fund for artists. well i love it! i think its maybe too detailed for a tattoo, especially if it would be smallish. tattoos are difficult and sometimes need to be simple. 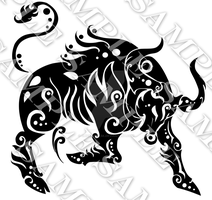 but the detail is what makes the design interesting, since you dont see celtic taurus! 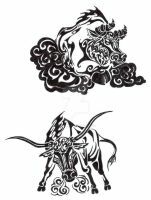 i personally am a leo, *and am dying to know how you would draw leo like this taurus* but i like how you added the symbol on the forehead! 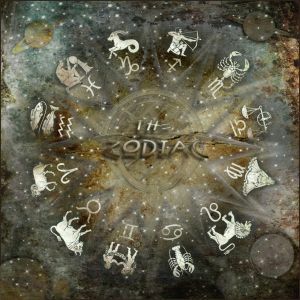 the idea was actually derived from the Taurean symbol on the first place. I do agree with you though, it is a *little* over ellaborate though - especially for the poor tattoo artist who has to do it in the end. but i visualise that on being pretty big either on his back or on his lower spine.